But then she is given a journal that her mom had kept when she lived in Italy. Suddenly Lina's uncovering a magical world of secret romances, art, and hidden bakeries. A world that inspires Lina, along with the ever-so-charming Ren, to follow in her mother's footsteps and unearth a secret that has been kept for far too long. It's a secret that will change everything she knew about her mother, her father - and even herself. Lina is mourning the loss of her mother and trying to figure out why in the world she agreed to travel halfway across the world to spend the summer with a man she's never met. In her first moments in Italy, she's counting down the days until she can go home to Seattle and stay with her best friend Addie. And then she is given a journal that her mother wrote sixteen years before during a magical year that she lived and went to school in Florence. Lina discovers a woman that she never knew in her mother. A woman who loved and lost and made hard decisions. And in the process of meeting this side of her mother for the first time, she discovers a lot about herself and who she can become if she gives Italy, and this father she has never known, a chance. This is totally Anna and the French Kiss meets My Girl 2. Anna because of the European setting, introduction to a quirky group of friends, and an ode to a beautiful, ancient city. My Girl 2 because Lina, and her fast friend Lorenzo (Ren) are hunting for long lost secrets about Lina's mother, bonding along the way. This comparison is not a bad thing. In fact, it's a wonderful thing, because I've determined that it makes quite a lovely summertime read. It is obvious from the get go that the author is in love with Florence, and by the end of the book, she makes you fall in love with it as well. The history and artwork is a character in of itself, not to mention the delicious descriptions of food and gelato. You can almost imagine yourself riding on the back of a scooter, traveling down country road that weave their way through vineyards to an ancient city with narrow streets that are shaded by laundry hanging from window sills above. Sigh. I have had the amazing fortune of traveling to Florence, but now I long to return. As for the characters. I want to start with my favorite, because he is, by far, my favorite adult featured in a teen book thus far in 2016 (actually maybe one of my favorites of all time). Howard, the giant Southern with a heart of gold reminds me A LOT of Liam Neeson's character in Love Actually. He obviously cares deeply about Lina, but he also lets her live. He trusts her and talks to her and becomes a confidant. His genuine kindness just blew me away, and I SO want to go stay with him in his cemetery home. He did luck out with Lina. Despite being dealt a rather harsh hand early in life, she's not a rebel. The death of her mother didn't make her mean or, well, rude. She's hurting, but she's discovering in a healthy way, surrounded by healthy adults and healthy peers. This is a hopeful, light book that is endearing. She is a confident, outspoken young woman, and by the end, I imagine her growing up to take the world by storm. And Ren. Well, Ren is the boy you wish you had met in a foreign country at sixteen. He's a friend first. A wonderful friend. And unsurprisingly he becomes more in the end. But he's also responsible and honest, a lovingly afraid of Howard. As for the secondary characters...they were woefully underdeveloped and underutilized. Minus one plot point, the "group" didn't add to the story at all. I can get past that though, but I genuinely enjoyed this book and its setting. 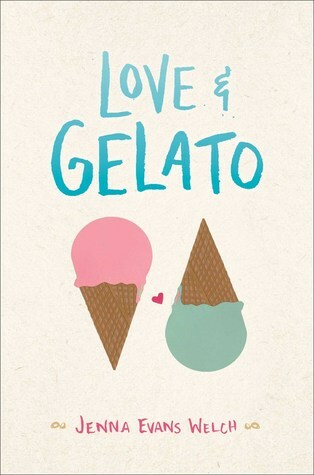 If you're looking for something light and not angsty, pick up this adorable summertime romance, and pretend you're taking a vacation in Italy, sitting in a piazza and eating gelato (it really is heavenly).